The HP ProLiant ML110 G7 server provides an affordable and functional solution to small/medium businesses that are budget-conscious and who have basic or no in-house IT resources. With proven ProLiant reliability and the support for the latest Intel Xeon, Core i3, Pentium processors and RPS and 2 NICs, the ML110 G7 provides the ideal solution to the growing business. A mix of PCI-Express slots, DIMM slots, drive bays, and server options delivers the expandability needed. Integrated iLO3 remote management drives down the operational costs by reducing the number of physical visits. HP Smart Start CD enhances the installation process further. Optional TPM provides for additional level of security. first server for growing businesses. G7 Server an ideal first server? step up to your first server network with ease. • HP conducts some of the most rigorous and thorough testing in the industry. This testing, along with a worldwide network of HP service professionals, allows you to deploy the ProLiant ML110 G7 Server with confidence. • ECC memory helps protect your business from data loss and unplanned system downtime. Unlike standard memory, ECC memory can detect and correct single‑bit errors. • HP Smart Array options provide businesses with RAID mirroring and striping capabilities to protect critical data. • The TPM hardware‑based encryption and authentication feature provides increased data security. 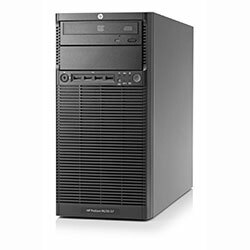 • HP ProLiant 100 series servers have customizable features suitable for the varying usage needs of small and medium businesses and branch offices.